This post is Part 2 in a series of weekly posts I’ll be doing on the process of sweater knitting: not exactly the nitty gritty details and techniques, but the opportunities and decisions you may encounter on the way to getting a knitted sweater that works for you. Because this is the 21st Century, and because knitting has been going on for a while now and knitters are human beings, there is a great variety of sweater styles out there to choose from. 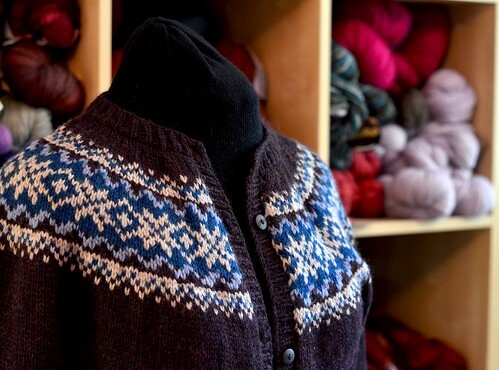 A lot of knitters have a distinctive preference for certain kinds of sweater patterns – top-down seamless, for example, or cardigans instead of pullovers – and they will choose sweater patterns based on that preference. If you are a knitter who is relatively new to sweater knitting, this can feel a bit disorienting, as though you must suddenly declare your position on these things right away or be lost forever. (Spoiler alert: you don’t have to do this). In particular one of the biggest discussions amongst knitters (well, sometimes it’s more of a debate) is whether to work in the round or “seamless”, or to work flat or “in pieces.” I have done both and enjoy both, and you can rest assured that there is no “right” way to do this – but there are certainly advantages and disadvantages to both. The disadvantages of working a sweater in pieces largely revolve around the fact that your finishing time is longer due to the fact that you will need to sew up those wonderfully structured seams. (Though it is worth pointing out that a lot of people like sewing up seams and take a lot of pleasure in doing this part well – your mileage may vary). Even though it feels like finishing the knitting part should mean that you’re “done,” you can’t actually wear a set of disassembled sweater pieces and call it a sweater. (Though many of us trying to rush-finish a sweater to wear to Rhinebeck have contemplated this many, many times). For me I usually have to mentally add on an extra day to do the finishing. You are also more likely to be working from the bottom up rather than the top down, which is a disadvantage if you prefer going from the top down to be able to measure fit as you go. Sweater styles constructed seamlessly are likely to include bottom-up or top-down construction, raglan sleeve, some set-in sleeve (with picked-up sts and short row sleeve cap shaping), and circular yoked sweaters, and may be also used for pullovers or cardigans. These kinds of sweaters have seen a resurgence in the last decade or so, for knitters who like to be able to avoid seams. This is one of the main advantages of working seamlessly. This kind of style also lends itself very easily to top-down construction, which has also been recently popular for knitters who like to be able to judge fit and length as you work, because a seamless top-down sweater can easily be “tried on” by slipping it off the needle and onto some waste yarn or multiple circular needles, and this makes it easier to judge the length and modify accordingly (for example, sleeve length can be easily extended or shortened simply by ceasing knitting at the desired point). You will also have a clearer sense right away if you are going to run out of yarn or not, as you will be able to see the full progress of the entire garment all at the same time. 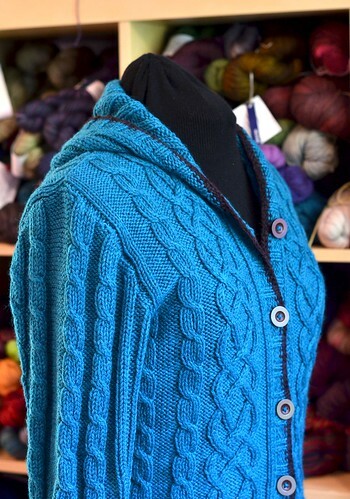 (The Hourglass pullover, below, and yoked cardigan from instructions by Elizabeth Zimmerman, are both seamless sweaters worked from the bottom up). Disadvantages of sweaters constructed seamlessly include the lack of structure provided by seams (which means you are best limited to yarn choices that include some structure and elasticity themselves, such as wool or wool blends, and plied yarn), and the fact that the project becomes more physically cumbersome the closer you get to finishing it. You need to mentally reckon with yourself that you will at some point have almost an entire sweater in your lap while you are still knitting with it, and this puts more weight onto your hands and wrists. If you are familiar with knitting blankets or afghans, consider the differences between knitting squares that are later pieced together, versus a blanket knitted all in one piece, and you will discover some similarities between knitting sweaters seamlessly vs. in pieces. In general, take a moment to look at how the sweater is constructed and how this fits into your own knitting preferences, along with considerations like whether the style pleases you and seems like something you would feel comfortable in. Always remember that you get to choose what you knit – breathe easy knowing that you can be in control of deciding what you like and don’t like. Construction method is important to think about when choosing a sweater pattern, because this can also sometimes lend itself to a particular garment style. For example, a drop-shoulder pullover constructed in pieces is probably going to have a fairly boxy fit, so as long as you choose a size that will fit you loosely, you can wear it comfortably. A lot of classic sweater patterns work like this, such as traditional Aran pullovers with lots of cables. These sweaters are meant to be warm and comfortable, more so than fitted and modern. Similarly, a circular yoked pullover is not ideal for a very fitted look, but is a classic when worn a little bit loosely. On the other hand, if you are making a set-in sleeve or raglan-sleeve sweater with waist shaping, you could more easily aim for a fitted style. A lot of contemporary patterns follow the fitted look, and these styles are becoming very diverse. When considering fit and style, this is also the moment when you want to think about ease. Positive ease means the garment is larger than your body, zero ease means the garment is the about same size as your body, for a close fit, and negative ease means the garment measures smaller than your body, for a very fitted look. My Water St. cardigan (Ravelry link) is intended for positive ease, since it is relatively light and drapey, whereas my Royale pullover is more suitable for zero ease or negative ease, since it is a fitted pullover shape and because a close fit displays the Bavarian cables very nicely. Knitted fabric does have some stretch to it, so the potential for comfortable negative-ease garments exists in the knitting world. The kind of ease you want will depend on the garment style and your own personal preferences. Often, the pattern instructions will indicate what is intended with the original sample or what kind of ease is being shown in the photographs, but just as often you may need to judge this for yourself. In terms of fit, one of the first pieces of information you will likely be looking for in any knitting pattern you are considering knitting is the range of sizes offered, and what size is closest to your own fit. This is a good place to start in deciding whether the pattern is for you – for example, if you are on the very-small or very-large end of the size range, you are more likely to encounter challenges in finding patterns that fit you, so if you’re new to sweaters it might help your comfort zone to choose a pattern that doesn’t require a lot of size modification (if you can help it). Having said that, though, size ranges do tend to be more expansive than they used to be (in the sense that they don’t always stop at a 42-inch bust, unlike many patterns of decades past), especially since the number of pattern sources out there is growing every year and more designers are aware of this issue. In order to understand what size you want, you must consider the kind of garment ease you want (positive ease/loose fit, negative ease/snug fit), but also your own body size. This means that if you are going to follow pattern instructions based on a specific pattern size, you must, absolutely, 100%, no getting around it, measure yourself. Do not pass go, do not collect $200. Get a fellow knitter friend over to your place and help each other out with this if you must, but absolutely know what size your own body is and how you want your knitted sweater to be related to that measurement. This will allow you to choose the pattern size that is right for you AND perform modifications to the pattern if necessary. There are a lot of measurements that are useful to take (and I’ll point out some resources for this, below), but the two most important ones off the top are: your bust circumference (measurement #1 shown here), and the width across your back between the ideal placement of the shoulder seams – also referred to as the cross-back measurement (measurement #4 shown at same link as previous). The bust circumference relates to how the sweater will fit around your body, and the cross-back measurement relates to how well the sweater will hang from your shoulders while it is worn. (Consider your shoulders to be the “coat hanger” in this scenario – and imagine what happens to sweaters in your closet if they are hung from a coat hanger that is too small or too large for the sweater that is hung on it. Pretty significant, no?) There ARE other measurements that come into play here, particularly if you are large-busted and want to add shaping with short-rows or vertical darts, but these two are important to start with no matter what your body size or shape is. 2. Your pattern size is not necessarily the same as your dress size or off-the-rack clothing size. This might seem like an obvious statement, but is worth pointing out nonetheless. When different sizes are indicated in the opening notes of a pattern, you may see a sizing note that looks something like: S(M, L, XL, 2XL, 3XL), and so on. Some patterns may even use dress size numbers like 6(8, 10, 12, 14), etc, but this is fortunately less likely to be the case in recent years. In any case: keep reading. Do not assume that because you buy Size L when purchasing clothing off the rack from your usual retail outlets that you are likely to need the Size L pattern size. These kinds of pattern references are most often used to track the pattern grading so that you the pattern instructions can later refer to notes like “when making sizes XL-3XL, proceed as follows”, or similar. To determine your own size, look closely in the pattern notes for a note like: S(M, L, XL, 2XL, 3XL), “to fit bust size 34(38, 42, 44, 48) ins”, or “garment bust size 36(40, 44, 46, 50), and so on. Armed with your own bust measurement notes and your desired amount of ease, you will be able to choose your pattern size accordingly. In the next installment of this blog series, I’ll talk a bit about yarn, yarn subsitution, and (gasp) the dratted gauge measurement. Choosing pattern size is an important step, but putting it together with yarn selection is what makes the completed sweater come together. Knitting Around, by Elizabeth Zimmerman, for a ‘first principles’ style discussion of patterns along with entertaining stories from her life and her knitting. Knitting from the Top Down, by Barbara Walker; one of the earliest guides to knitting from the top down, and a great resource for all kinds of garments worked in the round seamlessly. Big Girl Knits, by Jillian Moreno and Amy Singer; one of the earliest plus-size specific knitting books for women, including discussion of measurement, style, and fit. Little Red in the City, by Ysolda Teague; Contains an expansive section on garment fit and measurement, including different methods of bust-dart construction and detailed measurements. SweaterWise: Knitting a Sweater That Finally Fits You (Ravelry Links); This is an online resource by Sandi Wiseheart with a comprehensive worksheet and discussion of the kinds of measurements that can help you in achieving a sweater that fits you well. Fit to Flatter, by Amy Herzog; This is a blog post series with discussion not just of measurement and fit but of how different sweater styles might be customized for different body shapes. Happy knitting until next time! Absolutely wonderful amount of information. I’m going to have to read through it at least another time just to get it all. I’m very grateful you’re doing this. It’s a huge amount of information and it’s well organized and easy to read. I’m loving this series ….It’s information I’m mostly aware of but great to be reminded of it. This is such a great series – I’m really getting a lot out of it. Thank you so much for doing this. Thank you, Thank you, thank you for the time and thought you’ve put into this. I consider myself an experienced knitter of sweaters. I am embarking on a new project and this series is helping me to think about all of the things I’ve learned over the years in a logical and organized way as I plan my project. When I was a new knitter I was so anxious to start my project that I would overlook so many important considerations ( including a large enough swatch!) so I could jump right in. Now I really enjoy the anticipation that comes with thoughtful planning and copious swatching. I now LOVE swatching. It can be so inspiring as well as educational. Thanks for helping me be a better knitter! What a great blog you have! I already found a set of handwarmers I want to make here. you and your readers might want to enter! Knitting in the round . . . if you’re someone like me whose knitting in the round inevitably torques (I learned a new method of knitting to correct this problem and it didn’t work), no amount of blocking, no matter how aggressive, will remove the torque (been there, done that). It’s not really noticeable in mittens or a hat or a baby garment; in an adult sweater however . . . . If your knitting in the round torques (you’ll know it because your stitches will be slanting rather than vertical, pulling design elements such as cabling into a slant as well) you might want to stick with flat knitting, Yeah, the finishing is a big pain, but the knitting will look better.